Television listening systems offer great relief for families in which one person needs the TV turned up very loud so they can understand the dialog. With a TV Listener system, a small infrared transmitter sends the audio portion of the TV show to a wireless headset. The headset has a volume adjustment that lets the wearer boost the sound as needed, so they can clearly hear the dialog from the TV. If you or someone you know struggles with the volume adjustment problem while watching television, a TV Listener system is the perfect solution. For night-time TV watching, TellyPhones Wireless TV Headphones are a great way to watch (and hear!) 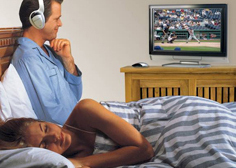 all your favorite late-night shows without disturbing your partner.